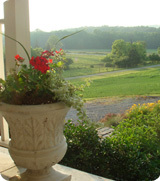 Hill Country Vista Suite offers a beautiful, tranquil location in northern Lancaster County near Morgantown, Pennsylvania. Our home is situated on a beautiful property with flower gardens and a gazebo, and is surrounded by Amish farms and fields. Enjoy a peaceful stay with all of today's modern conveniences.The suite offers a gorgeously decorated room for two, a cozy library, and an all inclusive bathroom with a whirlpool tub. In addition to the king sized bed, the bedroom offers a handsome armoire with a flat-screened TV and closet for your convenience. *Price is subject to change without notice. *Price is subject to 12% tax. Check in time is between 3:00-9:00PM and check out is by 12 noon, unless other arrangements are made. Cancellation Policy - no refund for cancellations made within 2 weeks of stay. 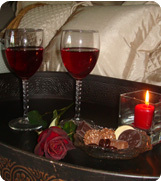 CONTACT US TODAY to schedule your night's stay and experience peace and quiet at Hill Country Vista Suite.